Not everyone may have heard, but there was a fire at Brittan Heights in December 2014. This fire started in the mid level unit and travelled up towards the top level condo. When the fire department came they of course sprayed water everywhere, which got into the downstairs unit too. So, three units were damaged in this fire. The source of the fire was undetermined. The good news is that I don’t believe anyone was hurt. The bad news is that these things usually take a long time to fix. First, there’s often an inventory taken by the insurance company to determine a valuation for the personal property and the damage to the unit. Then there’s the clean up. 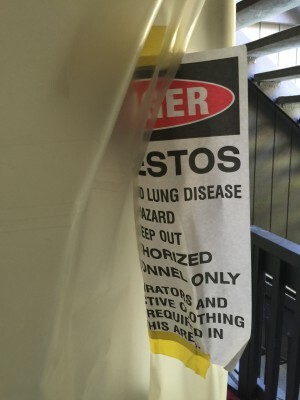 In this case, there are popcorn ceilings, so abatement companies must be brought in to deal with the asbestos. Homes which catch fire will also often require to be stripped down to the studs and completely gutted. This means cabinets, carpets…everything. This is so the wood structure can be sealed, otherwise the smoky smell may return for a long time. After its gutted, it of course needs to be rebuilt again, but such things also require permits. So permits must be taken out and reviewed. Often permits sought for such complete remodels might require mandatory code upgrades, so the rebuild gets more complicated and more expensive. Depending on the contractor and required code upgrades, it can take 1-2 years for a home to be ready to move back in after a fire. Moral of the story is make sure those smoke and carbon monoxide detectors are functioning and be well insured. Also, remember that you live in a community, if you’re careless, you could cause problems not just for yourself, but also for those neighbors around you. If you were one of those folks affected by the fire, I hope you are well and that your home gets repaired quickly. Hey… Why Does My Neighbor have AC?